In this month’s product update, we’ll show you how we’re improving data extraction from uploaded documents – bringing you one step closer to “real-time” bookkeeping. Accurately extracting data from documents in seconds isn’t new to Hubdoc. We do it on tens of thousands of auto-fetched documents (from our 700+ automated connections) every day! 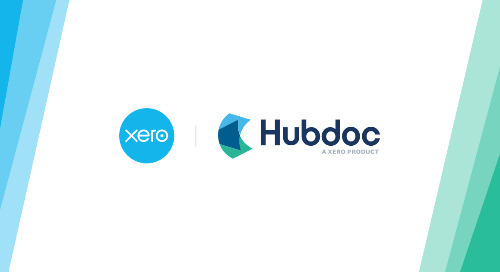 What we’re introducing is better, faster data extraction on some documents that are uploaded to Hubdoc via desktop, mobile device, email, and the Fujitsu ScanSnap scanner. Before we dive into the how, let’s take a moment to talk about the why. Why is “better, faster data extraction” so important? For accountants and bookkeepers, it means that bookkeeping gets done faster, resulting in time saved, improved client experiences, and growth opportunities. For small businesses, it means access to financial data in real-time, resulting in higher quality, more contextual decision making. It’s clear to see why access to real-time, accurate financial data is so important, but how are we making it happen? We recently launched the latest version of our machine learning-powered data extraction. This version accurately extracts key data from uploaded documents in less than five seconds. It’s currently working on a small percentage of documents, and that percentage will increase dramatically over time. How does Hubdoc’s machine learning-powered data extraction work? When a document is uploaded to Hubdoc, it's sent to a neural network (which is a computer system modeled on the human brain and nervous system) that reads the document and determines what data needs to be extracted. If it is very confident that it extracted the right data, it will be available to Hubdoc customers within five seconds. Accurate data extraction within five seconds! That’s really fast. Our machine learning-powered data extraction was trained by using tens of millions of financial documents. It analyzed each and every document to learn what data needed to be extracted. If, during this process, the wrong data was extracted from a document, our data scientists mathematically calculated how far off it was and made adjustments to the model. The next time the model attempted to extract data from an uploaded document, it got closer to the right answer. Adjustments are made to the model every time it extracts incorrect data and, as such, continues to improve over time. When will Hubdoc’s new machine learning-powered data extraction work on every uploaded document? Exclusively using machines to extract data from uploaded documents – without the use of human quality assurance – is really challenging. Companies that take this approach prioritize speed over accuracy, which can result in poor customer experiences. Instead, we’re going to slowly roll out this version of machine learning-powered data extraction, until we’re confident that it can accurately extract data from every uploaded document. 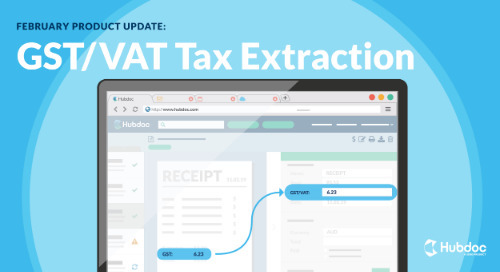 As the model gets better, it will be applied to more and more documents, improving your Hubdoc experience, and bringing you one step closer to “real-time” bookkeeping. How do I stay up-to-date or provide feedback on Hubdoc’s new machine learning-powered data extraction? We’ll use the monthly product update to keep you in the loop on any/all changes to our machine learning-powered data extraction. As always, you can email support@hubdoc.com to provide feedback! If you don't have a Hubdoc account and you want to see what all the fuss is about, book a demo with a member of our team! 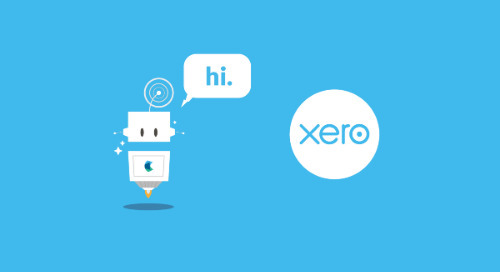 Get the details on the Xero blog! We’re pleased to bring you GST/VAT Tax Extraction in Australia, New Zealand, and the United Kingdom! Read on to learn more (and meet the team who builds these features). 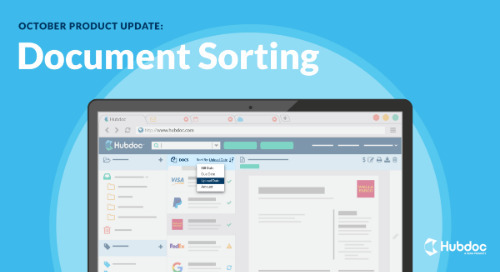 We’re excited to introduce Document Sorting, a small feature that promises big efficiency gains. 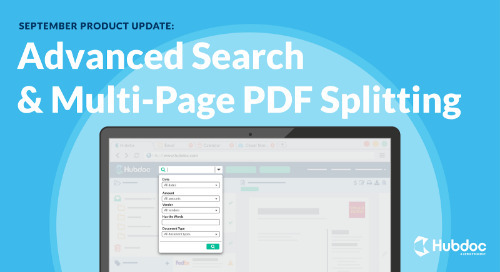 We’re excited to introduce Advanced Search, Multi-Page PDF Splitting, and 10 new automated connections in the United Kingdom! Everything good in business and life is about people and shared values. That is why we are so excited to get to work on executing our vision for the future as part of the Xero family. 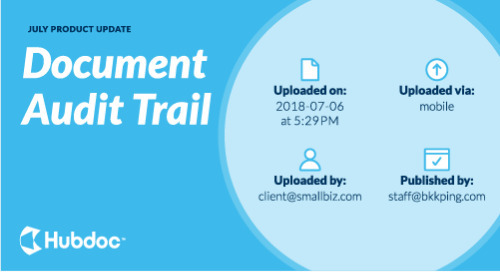 We’re excited to introduce Document Audit Trail! 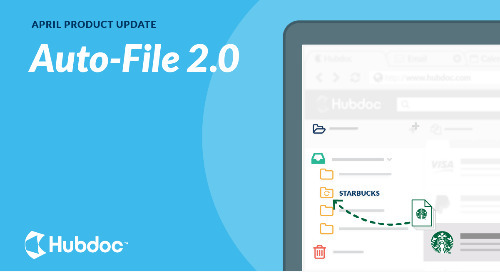 Get insight into when, who, and how documents were uploaded into Hubdoc. Learn more in our product update! What’s better than automatic folder creation and document organization? The ability to merge and delete folders/vendors, and to only have to do it once! 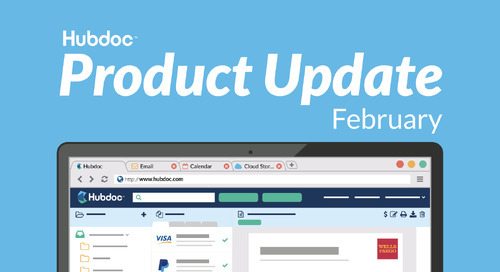 We’re excited to introduce our brand new Monthly Product Update! This month, we’re introducing Two-Factor Authentication, Zoom, and 16 new automated connections.